Team Q4 playmat given out to those that attended Bushiroad's Anime Expo 2018 panel. 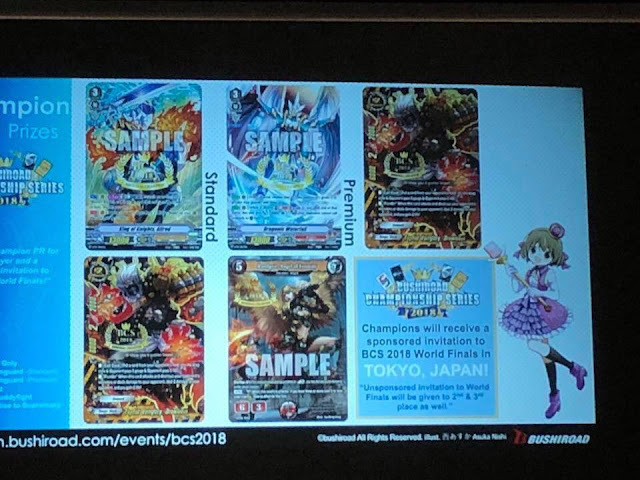 At Bushiroad's Anime Expo 2018 panel today, it was announced that the Android and iOS mobile game Cardfight!! 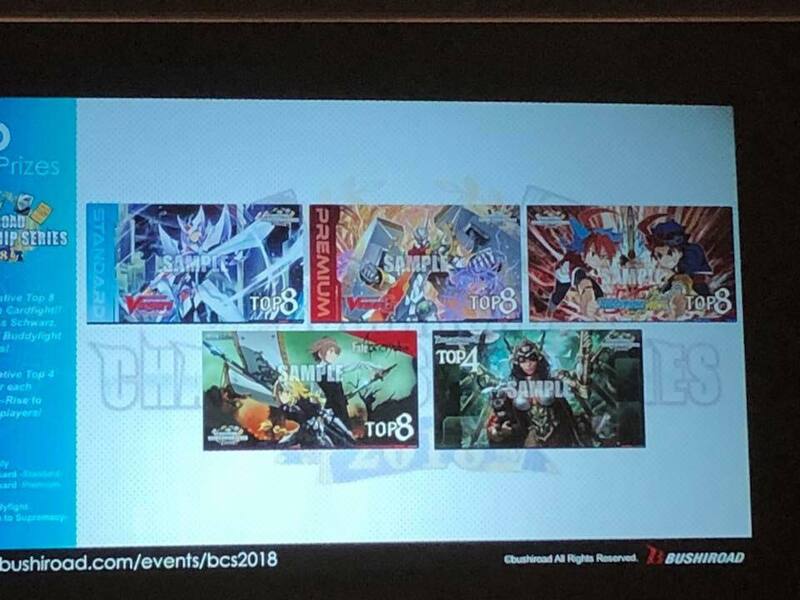 Vanguard Zero will be launching in English Spring 2019; the Japanese edition was previously announced for Winter 2018. The app will provide players with an opportunity to relive the anime series and cardfight their rivals from anywhere in the world. As previously announced, the autumn circuit for Vanguard will be split into separate best-of-one Premium and Standard tournaments. 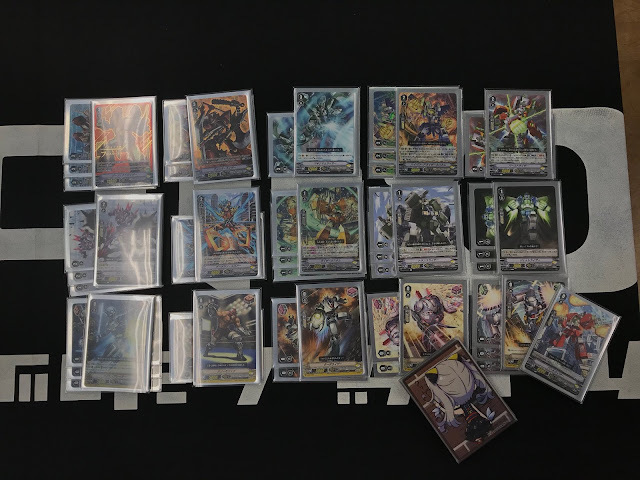 According to our sources on-site, participants in the Standard tournament will receive an alternate artwork print of Wingal and a Team Q4 deckbox, while participants in the Premium tournament will receive a promotional print of Lizard Soldier Conroe and a Team Striders deckbox. 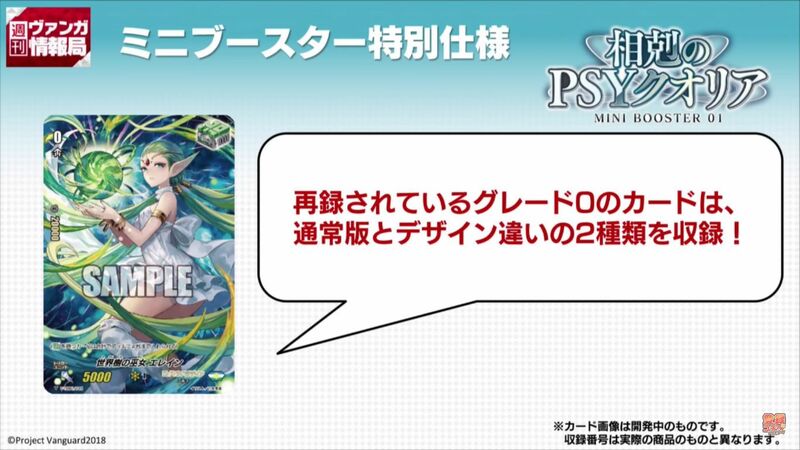 The top 8 playmat for Standard will feature Blaster Blade, and the top 8 playmat for Premium will feature Chronojet Dragon Z. 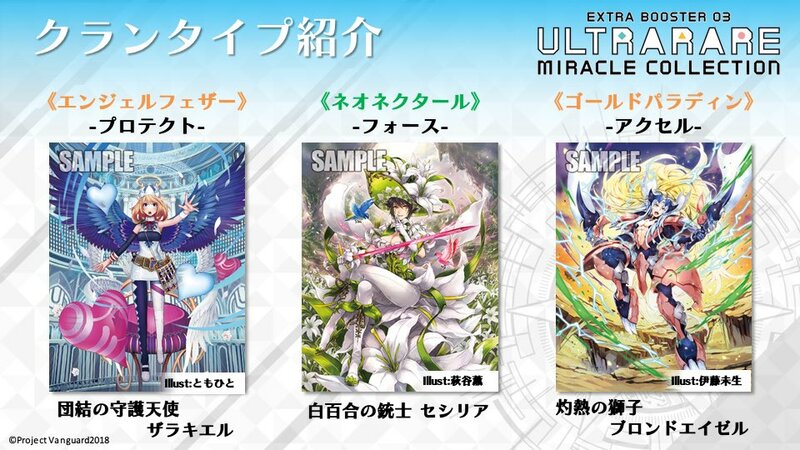 The tournament champions will receive promotional prints of King of Knights Alfred (Standard) and Dragonic Waterfall (Premium) and participants will also be able to get limited edition Blaster Blade sleeves at the tournaments. 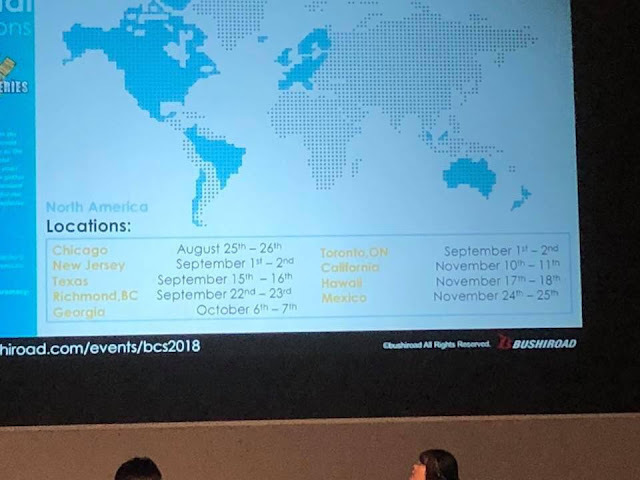 The North American locations for the 2018 world championships are presented below, in chronological order. In addition to these locations, tournaments will also take place in Western Europe, South America, and Asia-Oceania. The Ultra Rare Extra Booster was also announced at the panel, simultaneous to its reveal at BCF2018 Nagoya. 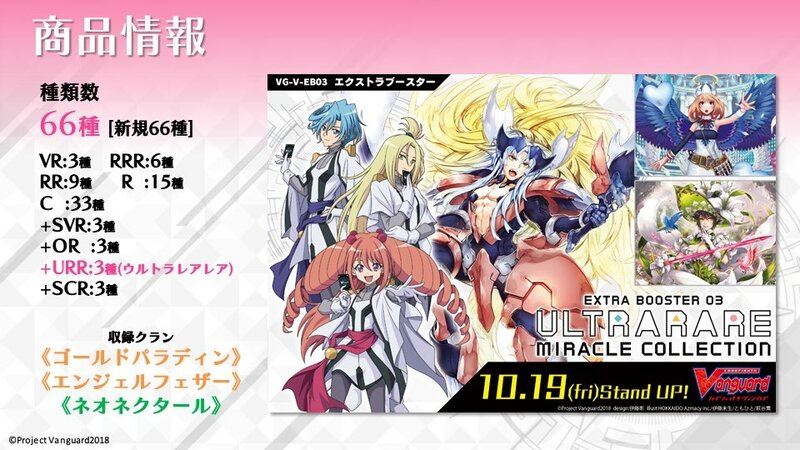 No English release date was given, but the set arrives in Japan October 19th. 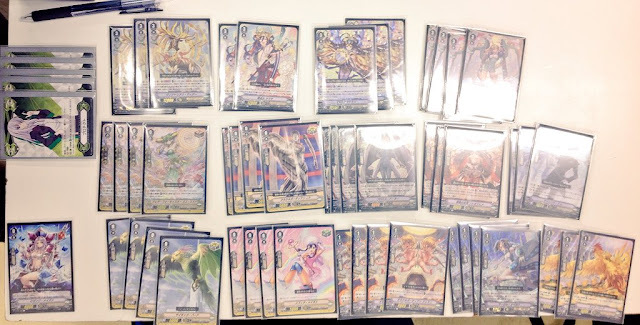 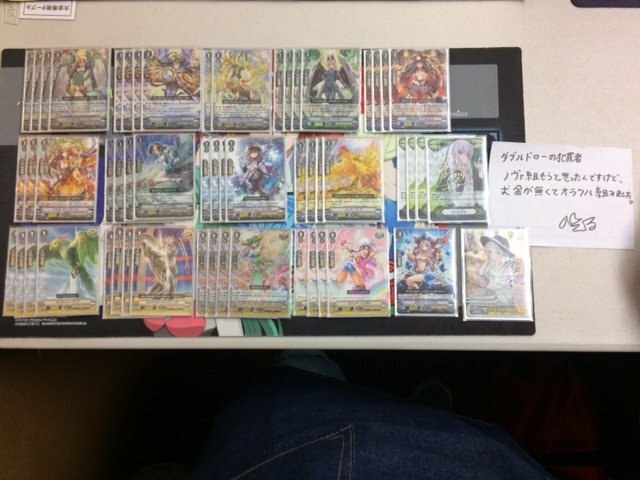 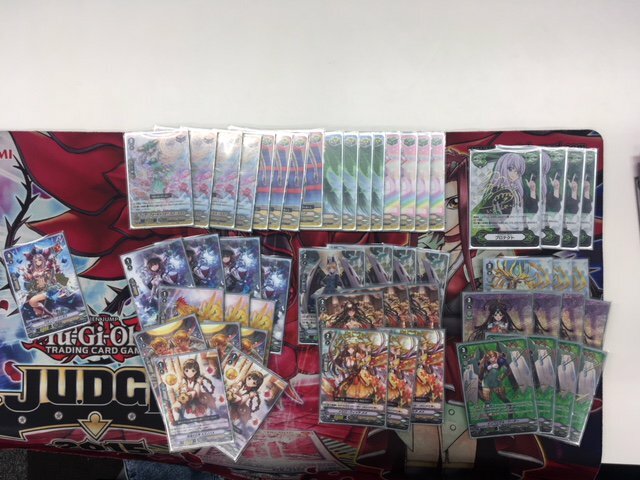 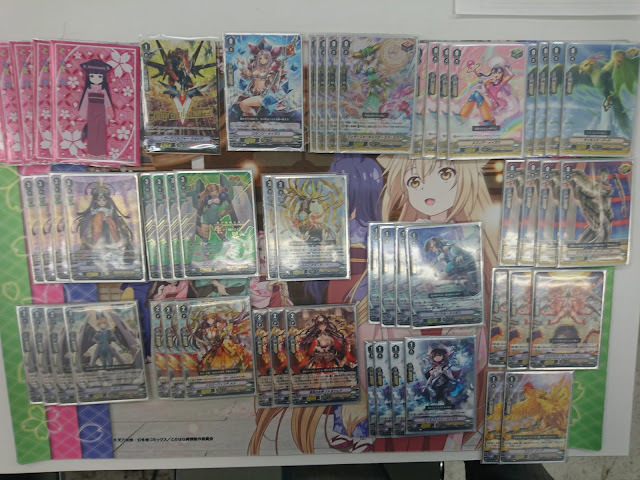 Today at both the BCF 2018 regional tournament in Nagoya and at Bushiroad's Anime Expo 2018 panel, the third Extra Booster of the Standard format was announced, V-Extra Booster 03: Ultra Rare Miracle Collection. The set is launching in Japan October 19th, 2018, and will feature support for the Gold Paladin, Angel Feather, and Neo Nectar clans, used by the three members of the idol group Ultra Rare in the 2018 Cardfight!! 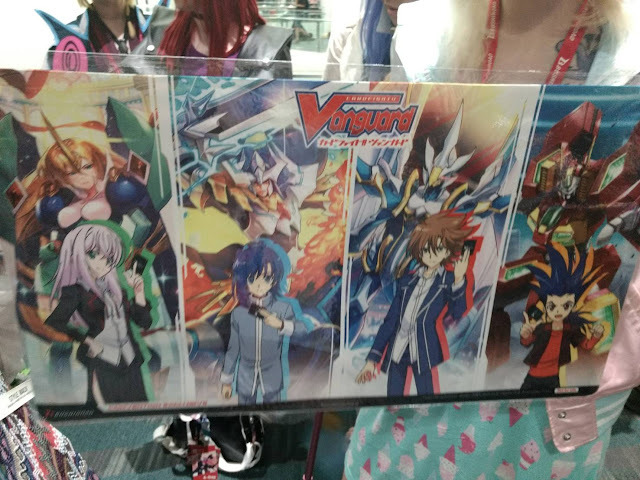 Vanguard anime reboot. 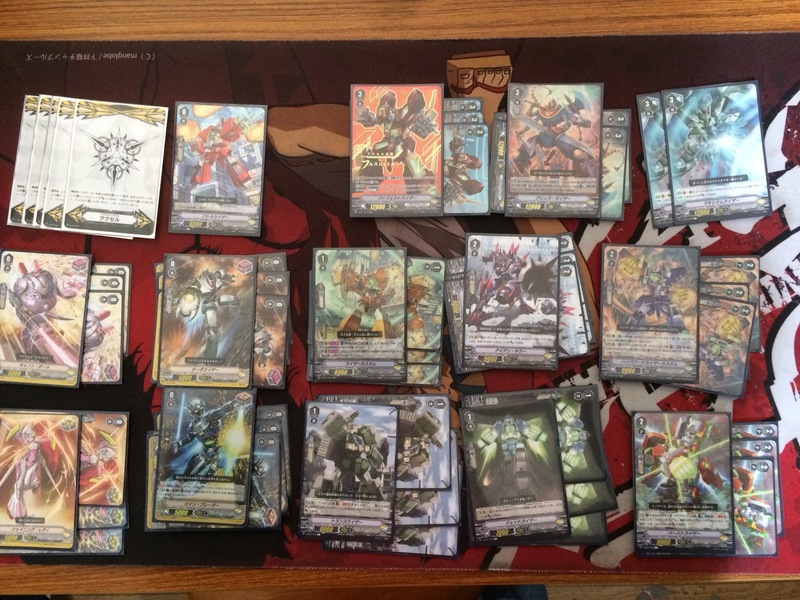 The set features 66 cards in total, 3 Vanguard Rares, 6 Triple Rares, 9 Double Rares, 15 Single Rares, and 33 Commons. In addition to these, it comprises 3 Super Vanguard Rare reprints of the VRs, 3 Origin Rares featuring the units' artwork from the original series, 3 Secret Rares, and 3 cards in a new rarity--Ultra Rare Rare. These "URRs" will be signed by the voice actresses portraying Ultra Rare in Japan, Terakawa Aimi, Mimori Suzuko, and Nanjo Yoshino. 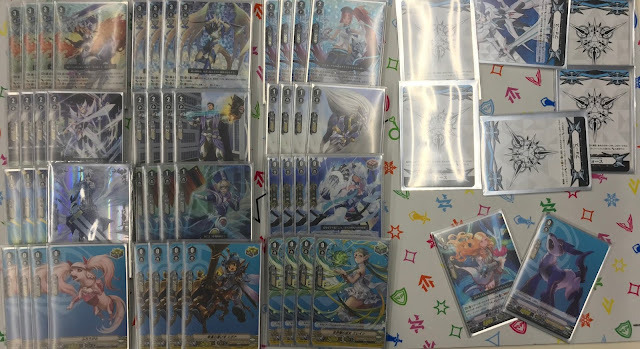 The set's cover cards are Ultra Rare's key units from the manga the anime is based on, Tatsunagi Suiko's Solidify Celestial Zerachiel, Tatsunagi Rekka's White Lily Musketeer Cecilia, and Tatsunagi Kourin's Incandescent Lion Blond Ezel. 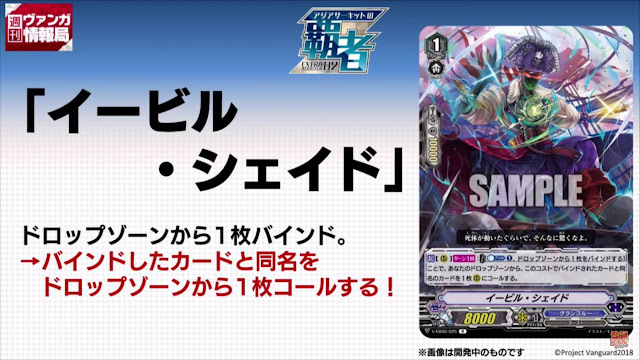 As previously announced Angel Feather is a Protect clan which can make use of its damage swapping abilities to heal by sending Protect Gifts to the damage zone, exploiting how Protect Gifts cannot exist outside the hand or guardian circle. Newly revealed is that Neo Nectar will have the Force Gift and Gold Paladin will have Accel, preserving the existing pattern of each Extra Booster containing exactly one clan of each Gift type. 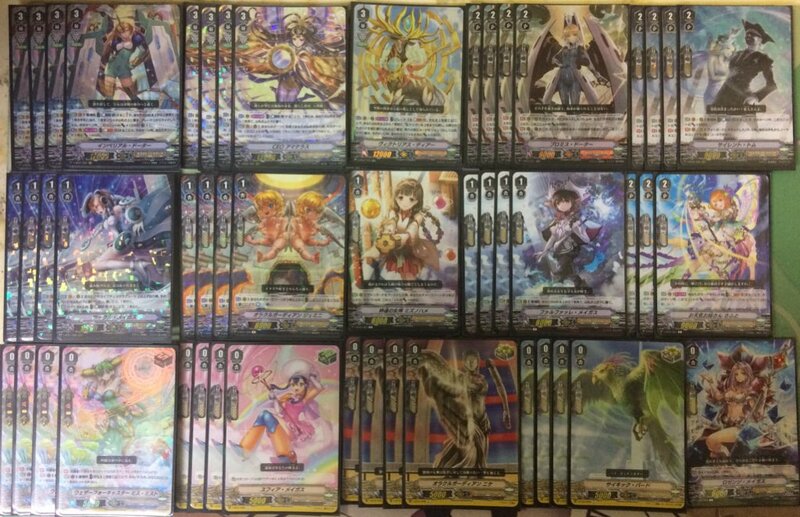 Although previously Neo Nectar was pointed to as a viable Accel candidate due to the additional circles synergizing with its cloning and "if you have a unit with the same name" mechanics, the shift to Force seemingly transitions them from their G-era play style focusing on large "Bloom" columns to fields of similarly-grand scale. 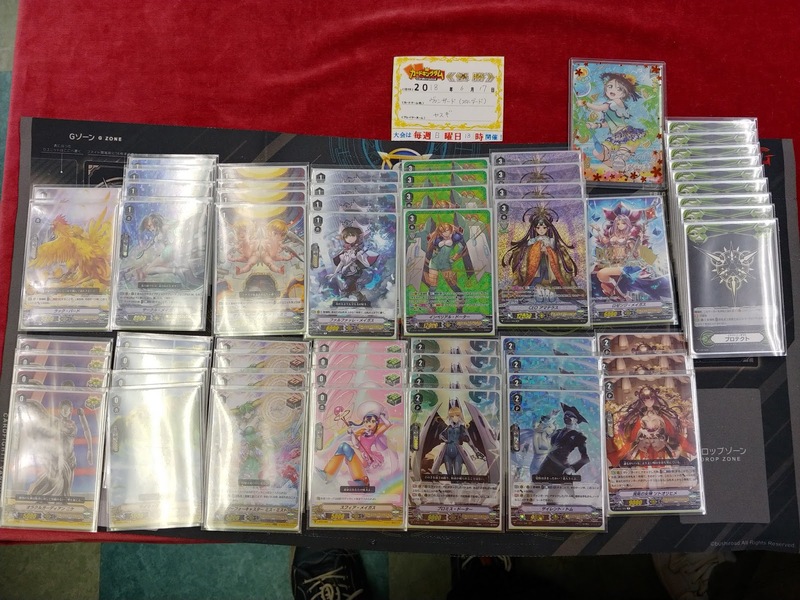 While Cecilia was one of the first subclan boss cards in the original game, interacting only with "Musketeer" units within Neo Nectar, and Zerachiel was similarly Celestial-locked in her first run, other subclans like Machining and Raizer have already been redesigned as mostly-generic support in Standard. It's conceivable that Cecilia will follow suit. 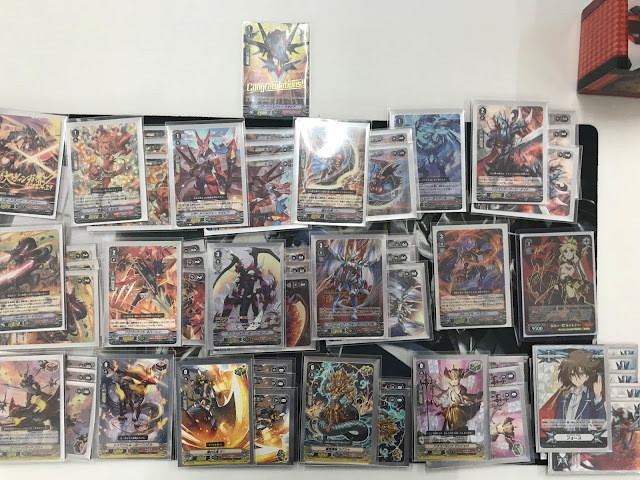 This also suggests that Great Nature will be an Accel clan, as thus far each nation has received at least one Gift of each type. 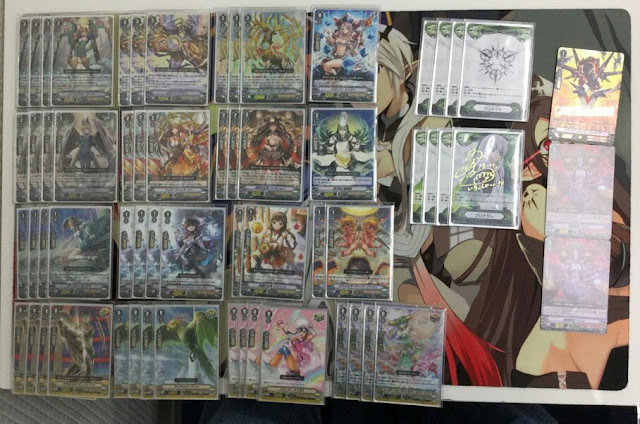 With Megacolony as Protect and Neo Nectar as Force, that leaves Great Nature to become Zoo's Accel clan. More information will be coming in the July 10th stream, this Tuesday. V-Mini Booster 01: Rivalry of PSY Qualia launches September 28th in Japan. 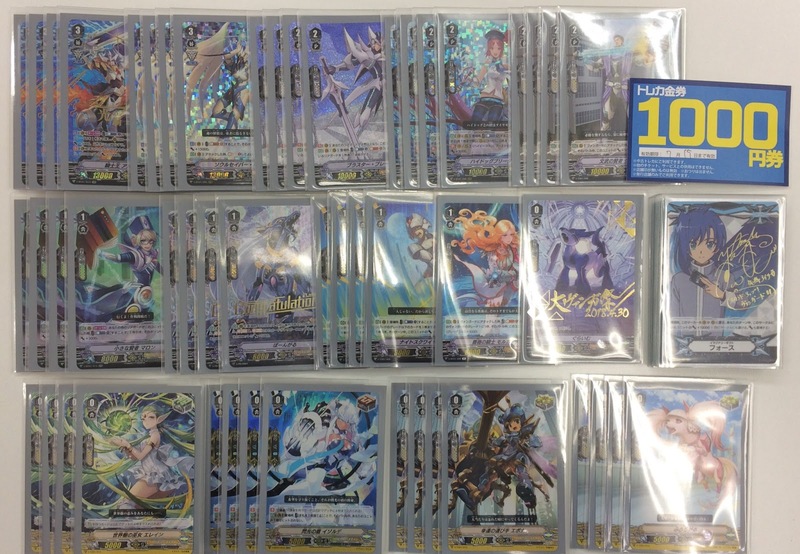 The first-ever Mini Booster contains only 8 new cards, alongside 36 reprints. 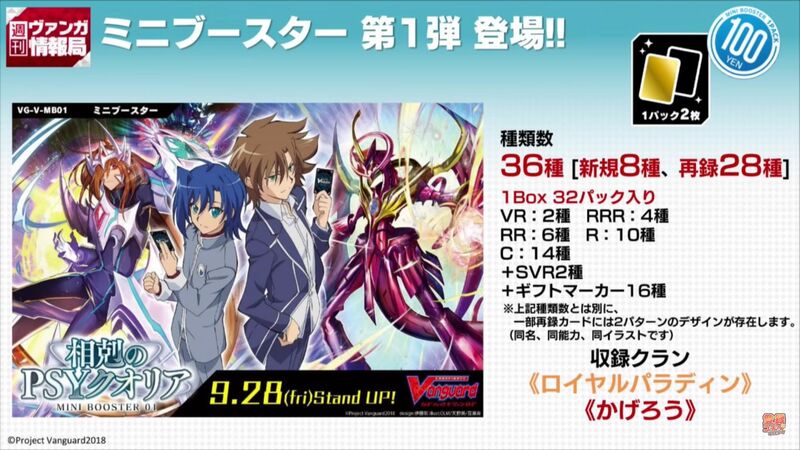 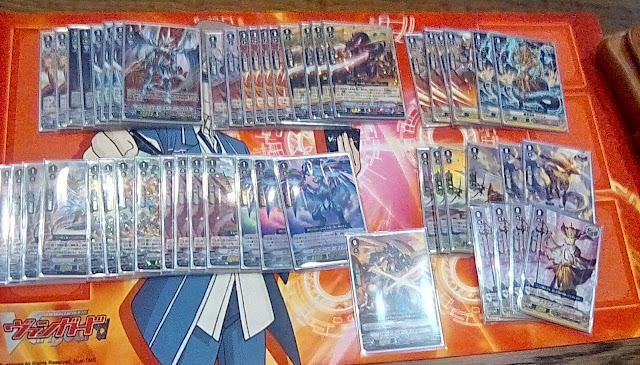 The booster contains support for both Royal Paladin and Kagerо̄, with its cover cards being Exculpate the Blaster and Dragonic Nouvelle Vague, Kai and Aichi's trump cards from the end of the manga's fifth volume. 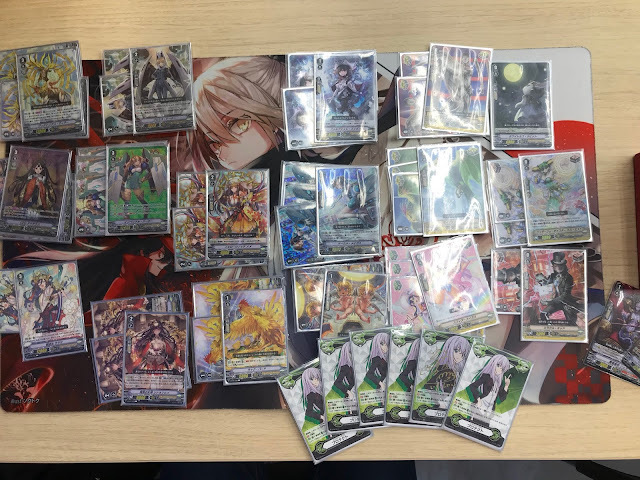 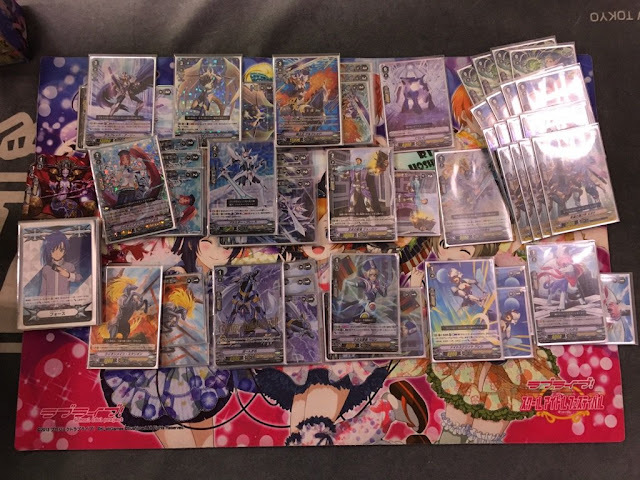 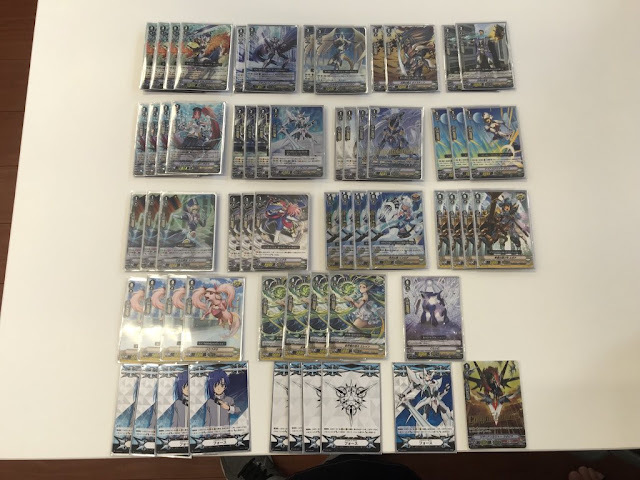 The set comprises 2 Vanguard Rares, 4 Triple Rares, 6 Double Rares, 10 Single Rares, and 14 Commons, along with 2 Special Vanguard Rare alternate prints and 16 Gift Markers based on various scenes form the anime. 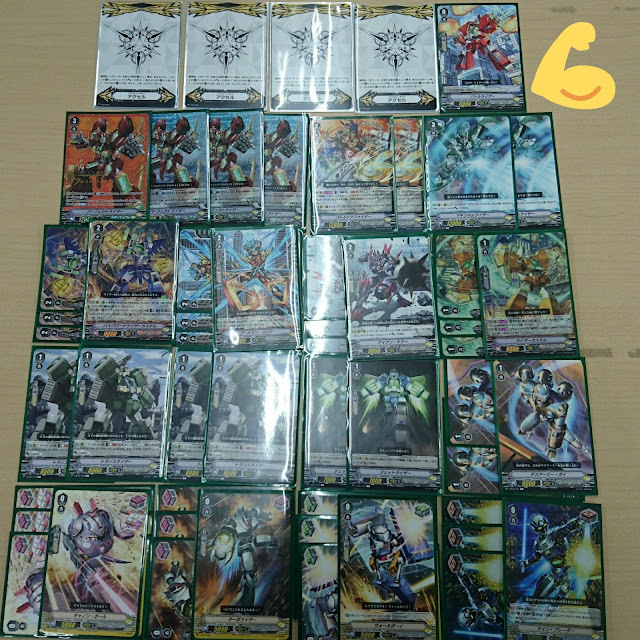 Each pack contains just 2 cards, with booster packs costing 100 yen (~$0.90) rather than the normal 300, and each boxes contains 32 packs, with a guaranteed Vanguard Rare or Special Vanguard Rare in each. Every pack contains either a Single Rare or higher or a holographic print of a Common. 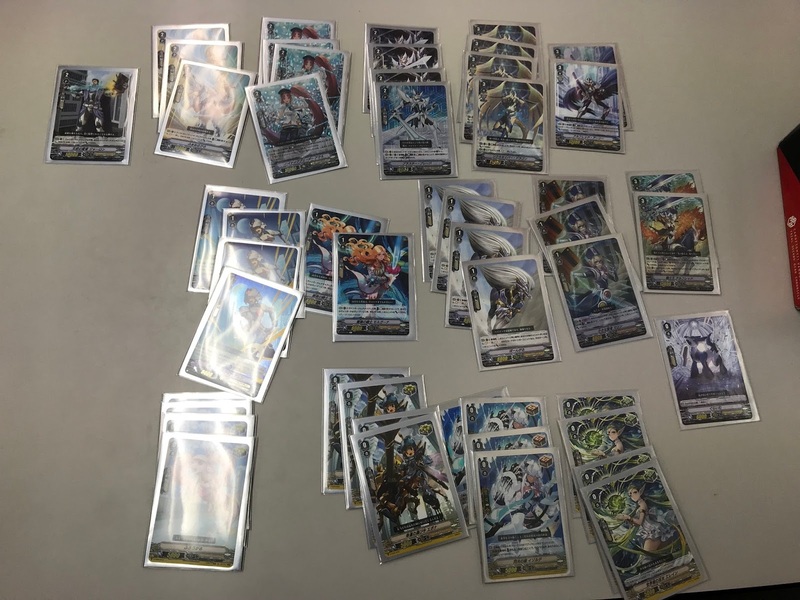 The grade 0 reprints have 2 versions, 1 normal version and 1 version with a modified card frame that allows artwork to completely fill the card. This week's card reveals focus on Granblue. ACT [Rearguard Circle] Once per turn: [Counterblast 1, bind 1 card from your drop zone] Call a card from your drop zone to Rearguard Circle with the same name as the bound card. 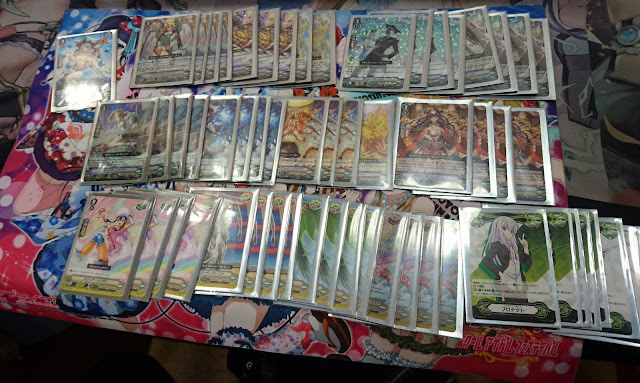 CONT [Hand]: This card cannot be Normal Called. 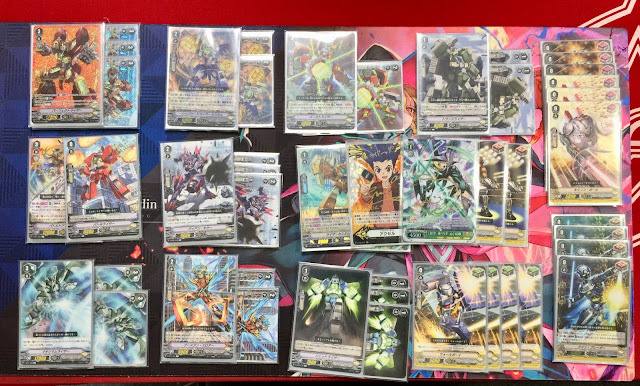 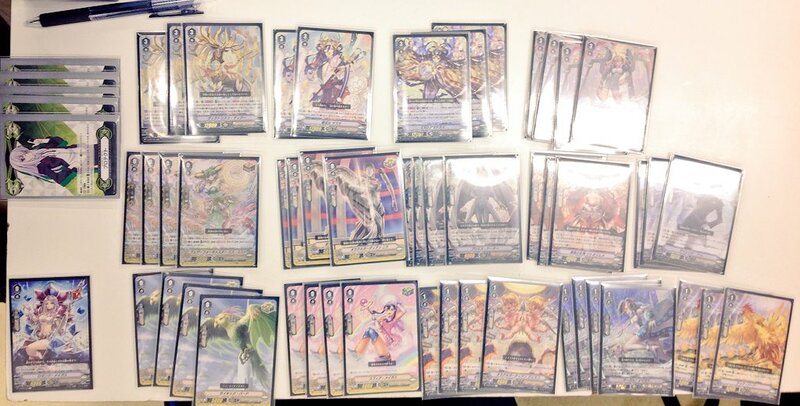 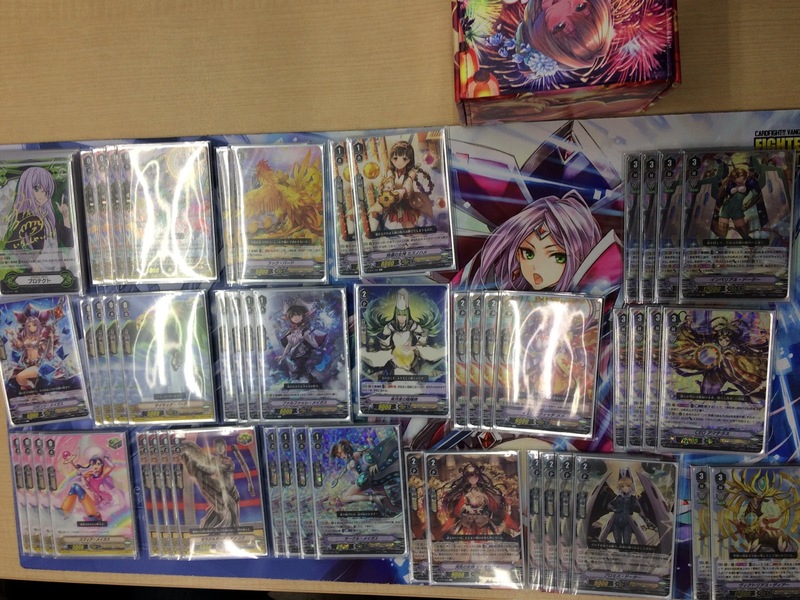 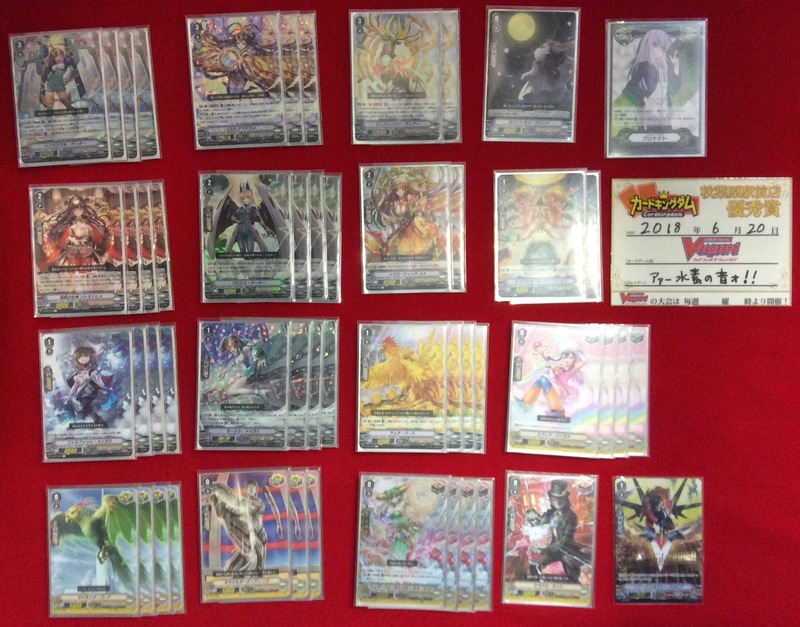 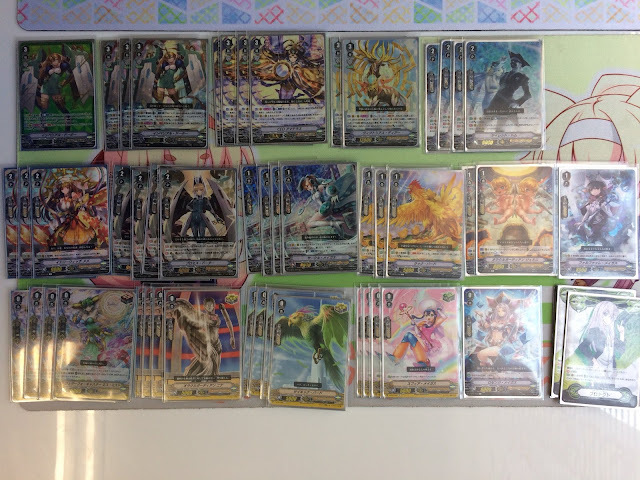 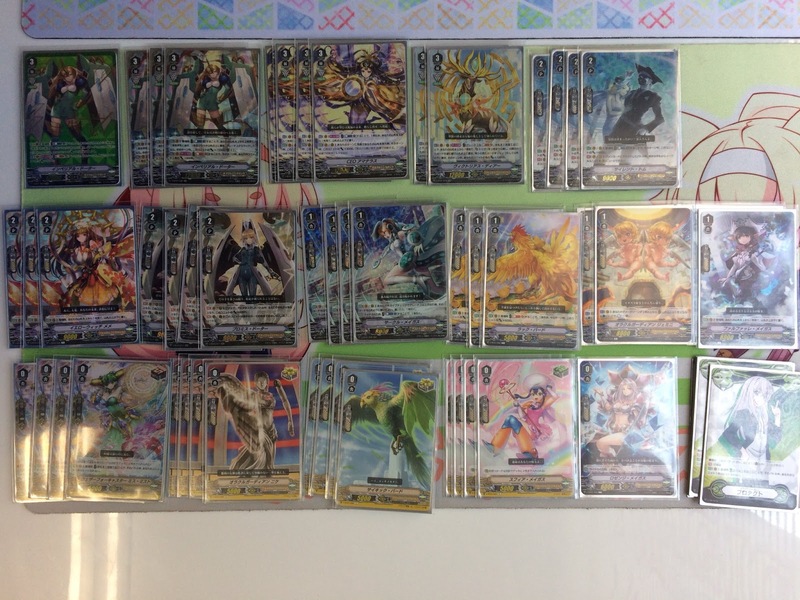 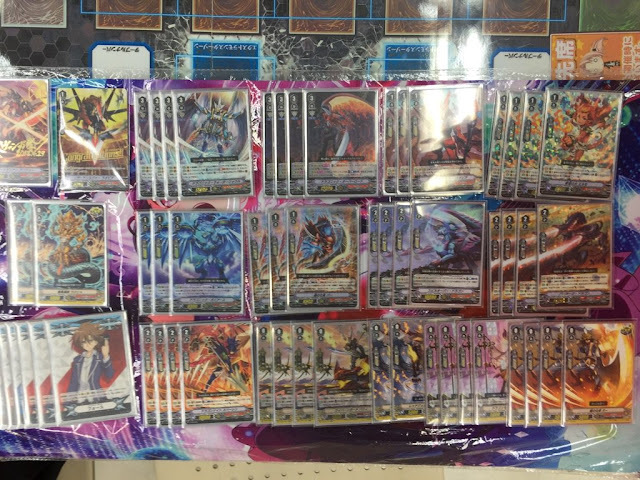 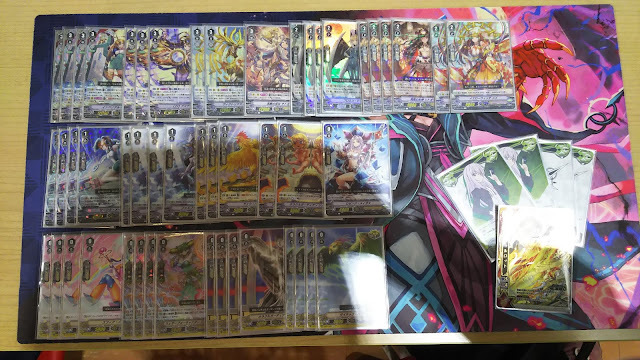 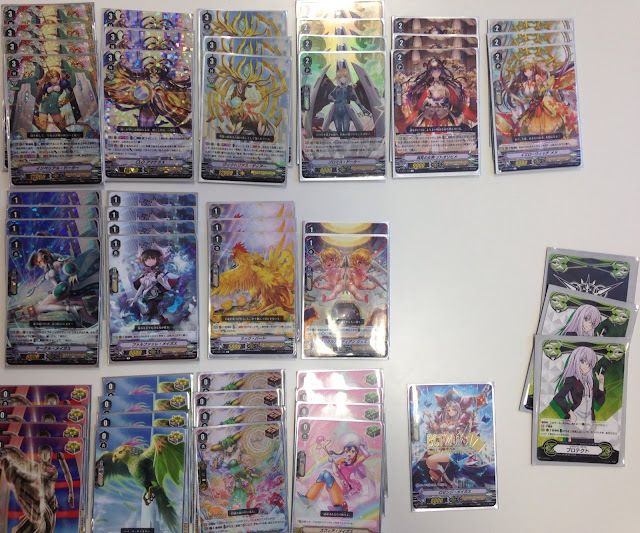 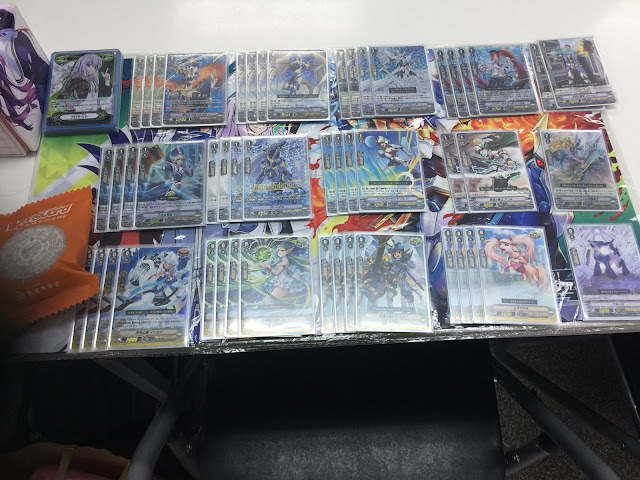 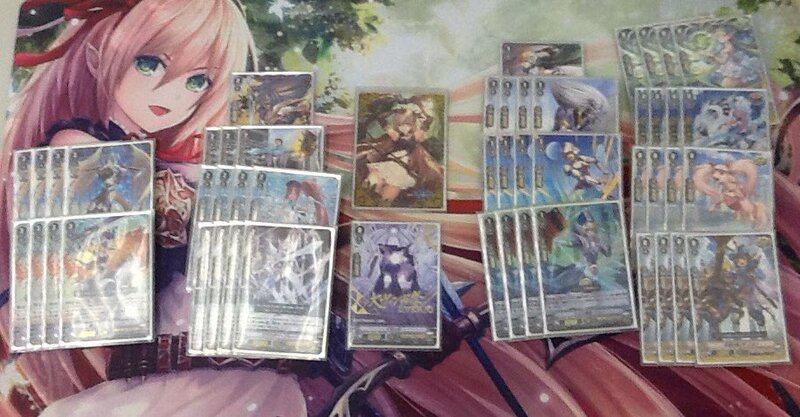 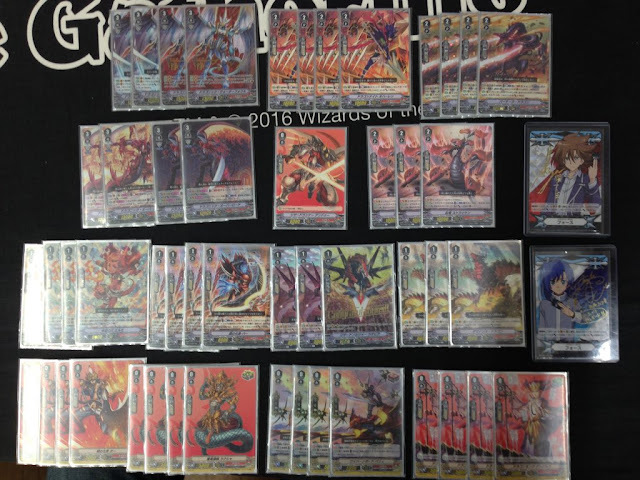 CONT [Vanguard/Rearguard Circle]: During yoru turn, for each card in your drop zone, this unit gets Power +2000. 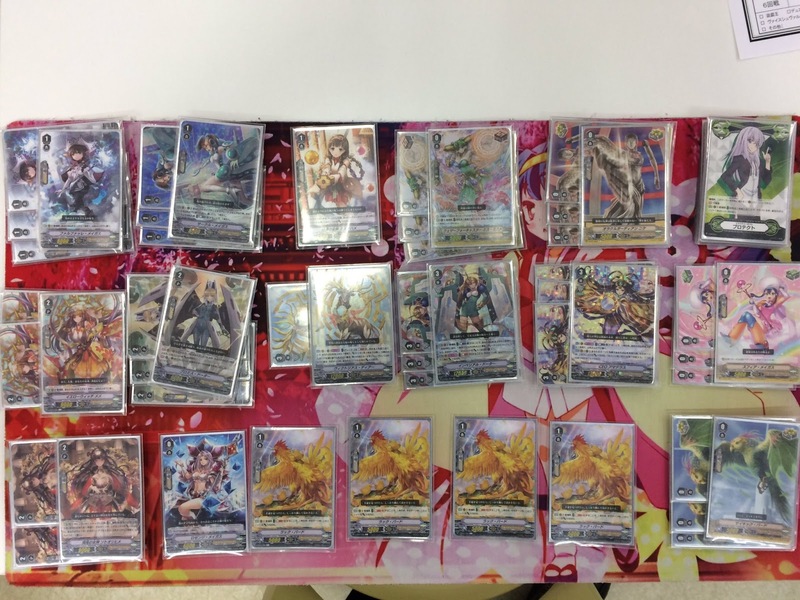 CONT [Rearguard Circle]: At the end of the battle it attacked, retire this unit. CONT [Vanguard Circle]: During your turn, if the number of cards in your drop zone is 10 or greater, this unit gets Power +5000/Critical +1. 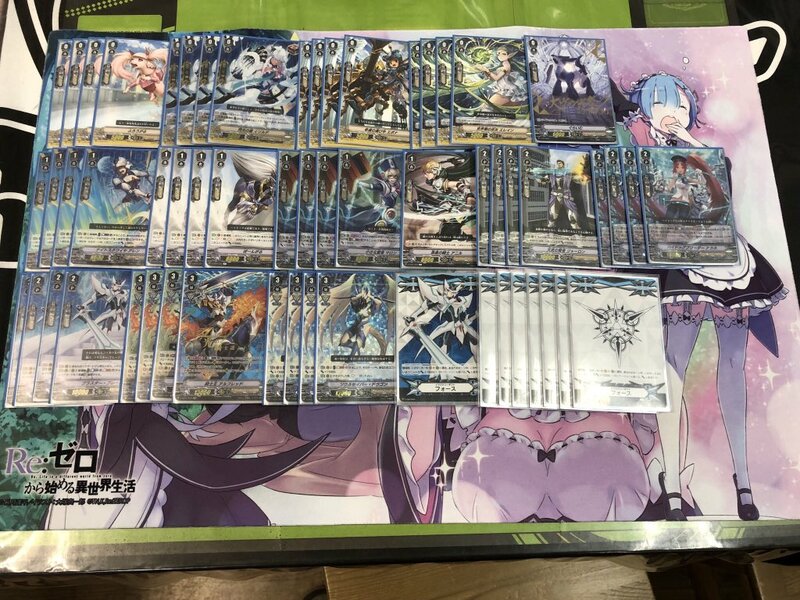 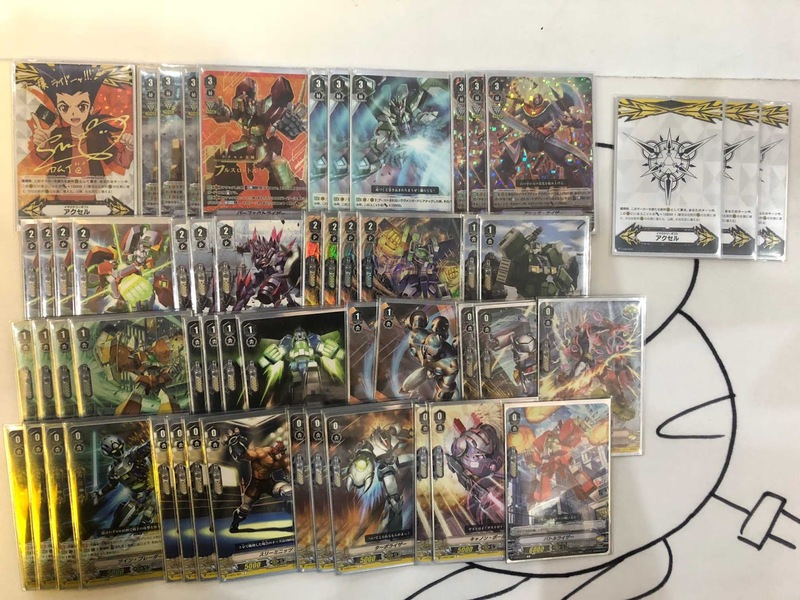 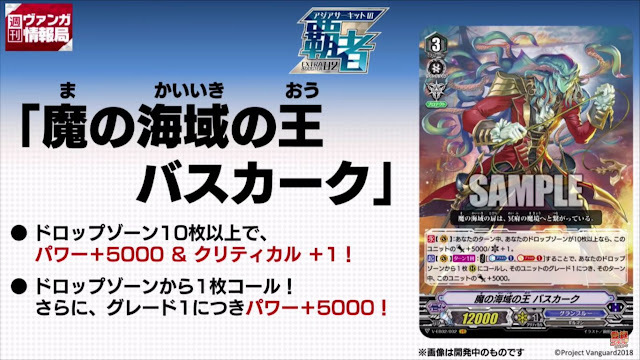 ACT [Vanguard Circle] Once per turn: [Counterblast 1, Soulblast 1] Call 1 card from your drop zone to Rearguard Circle, and for each of that unit's Grades, this unit gets Power +5000 until end of turn. 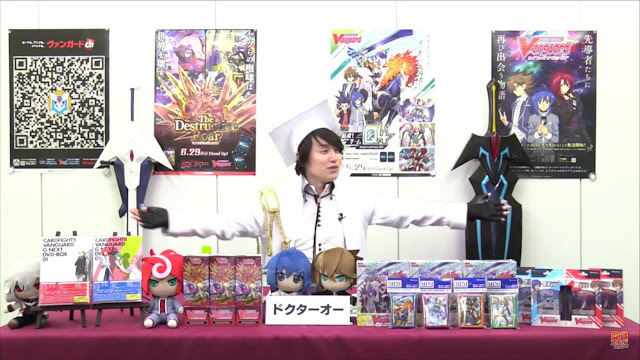 This week's episode of the rebooted Weekly Bites series features live-size replicas of Blaster Blade and Blaster Dark's swords. 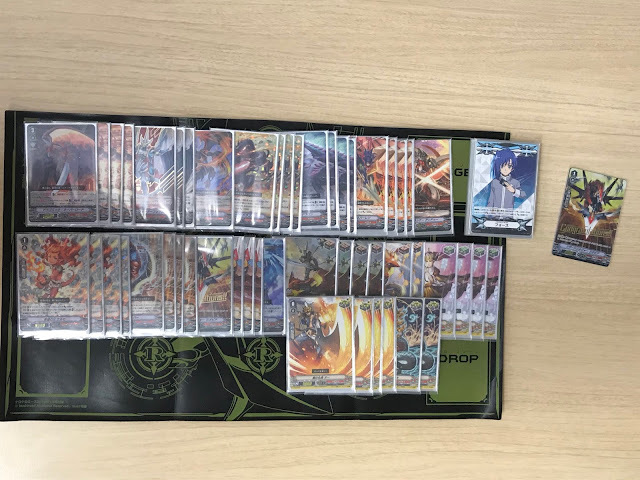 The fourth round of the shop showdown is Sendо̄ Aichi versus Sо̄ryū Leon. 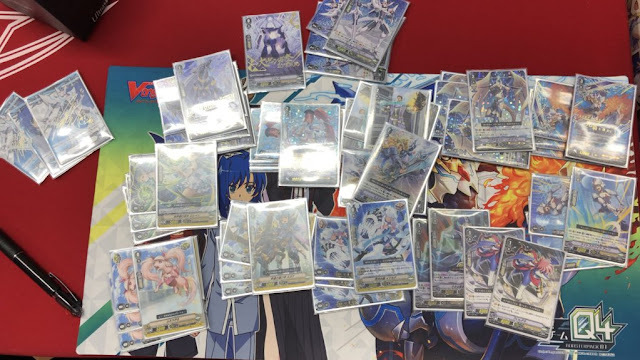 Struggling against something Leon calls "the Wind," Aichi witnesses a completely different image in their fight from anything he's seen before. Image 12 "The Mysterious Enemy, Foo Fighter!!" 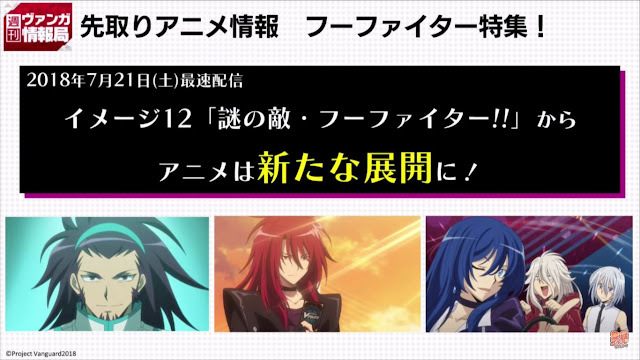 airing July 21st introduces the Foo Fighters, and begins their arc of the anime series. 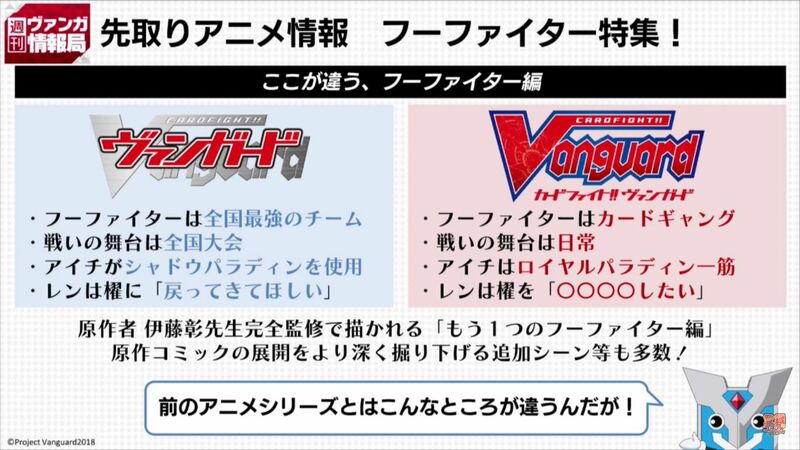 In the first season, Team Foo Fighter was Japan's strongest team. 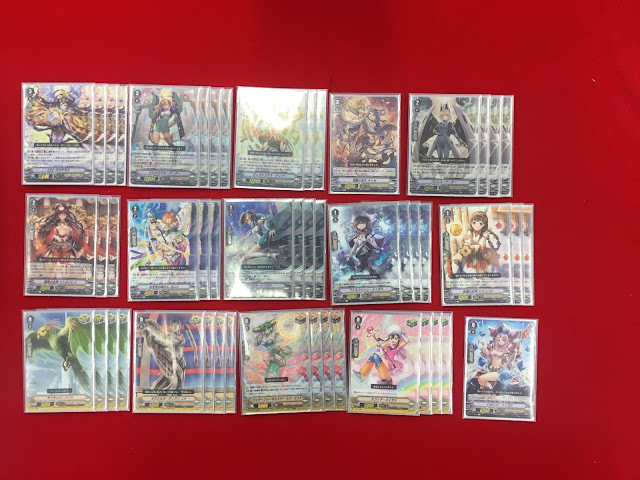 In the 2018 series, the Foo Fighters are a Card Gang. 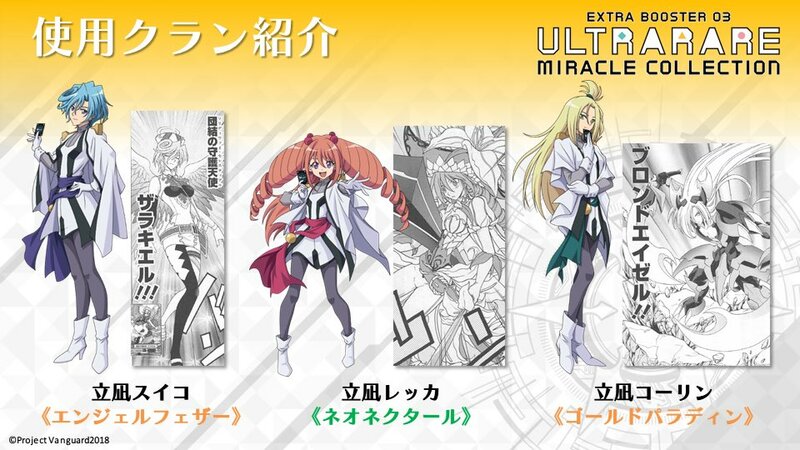 In the original anime the battle against them was set in the national championship tournament, but in the reboot they are fought as part of everyday life. In the 2011 version of this arc, Aichi used Shadow Paladin; in the 2018 version, he continues to use Royal Paladin. In the first season, Ren wanted Kai to return to him. In this season, Ren wants to ____ Kai. This is all based directly on Itо̄ Akira's Cardfight!! Vanguard manga, and with his supervision additional scenes (not found in the comics) are also being developed. 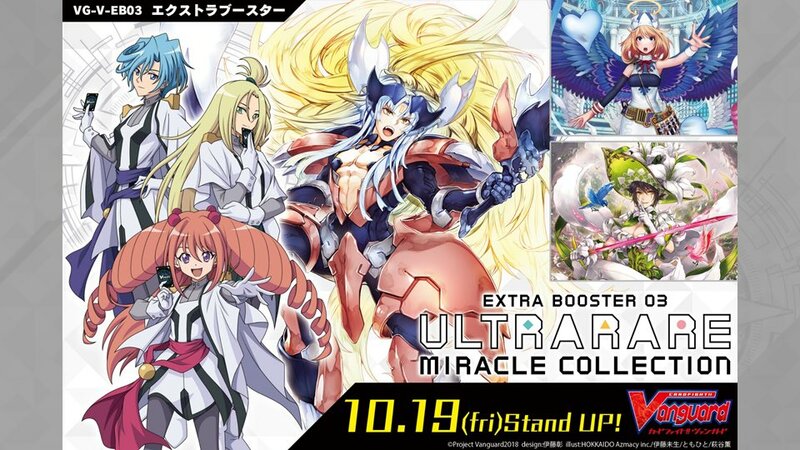 The manga was originally published simultaneous to the first season; internationally it's published by Vertical Inc. The Q4 versus Foo Fighter arc is adapted directly from volumes 2 through 5 of the manga. 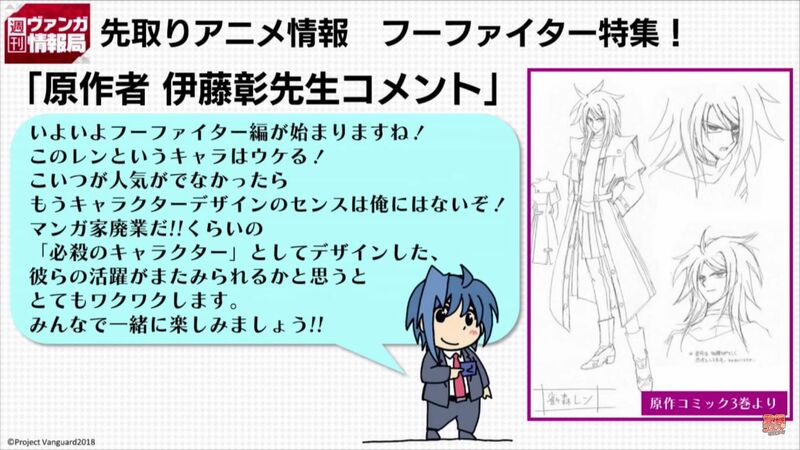 Itо̄ Akira's character design of Suzugamori Ren, which can be found in the in-between pages of volume 3. Itо̄-sensei is excited that the Foo Fighter arc is finally beginning. Image 12 "The Mysterious Enemy, Foo Fighter!!" A member of the mysterious gang "Foo Fighter," Kawanami Minami, suddenly appears in the peaceful Card Capital. 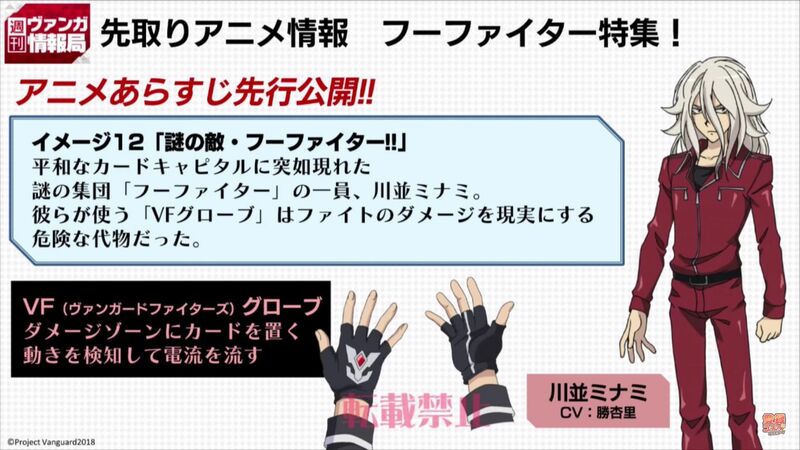 He uses a dangerous piece of equipment called the "VF Gloves" to make the damage from a fight become real. 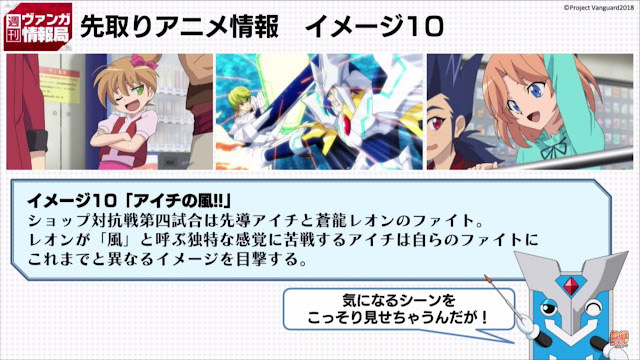 This twelfth episode is a straight adaptation of the manga's fifth chapter. 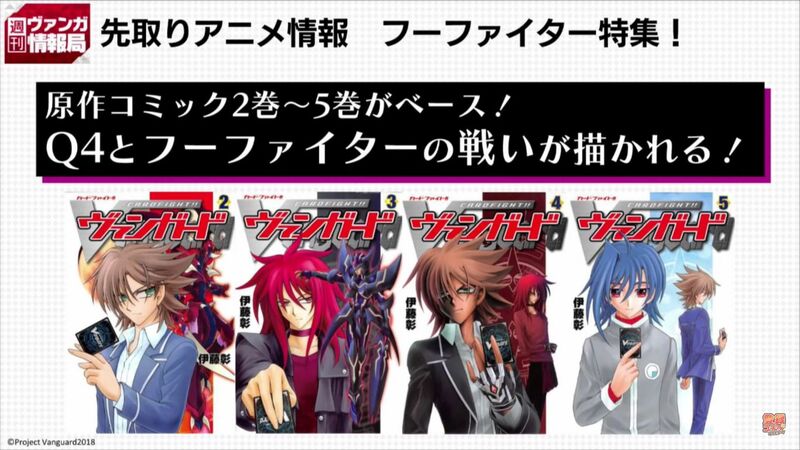 "The real battle begins between Kai with his painful past and Ren driven mad by his "PSY Qualia." 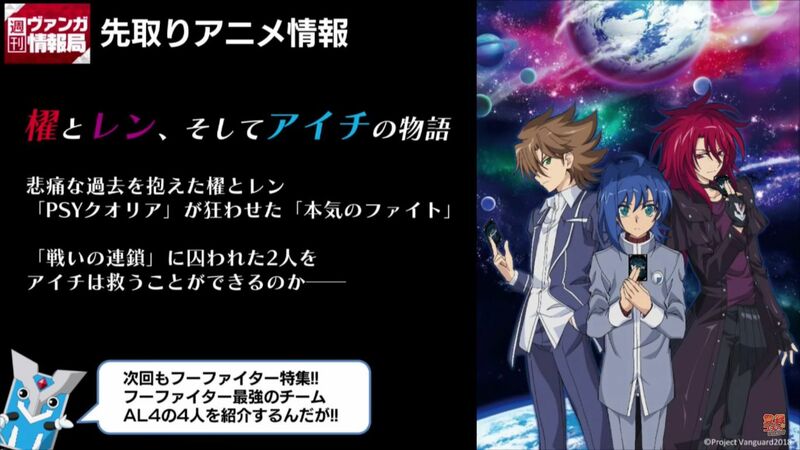 Can Aichi save these two, caught up in their chain of battles...?" 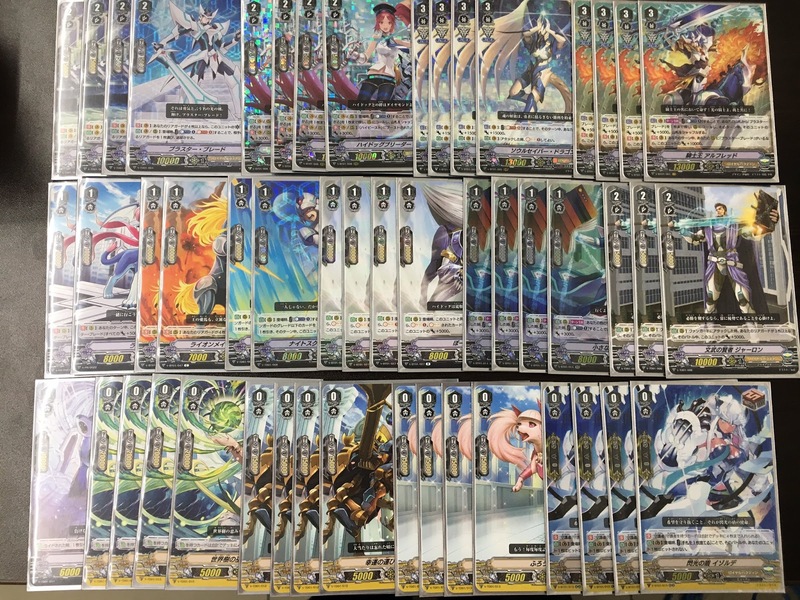 Oracle Think Tank tops are up by ~9%. 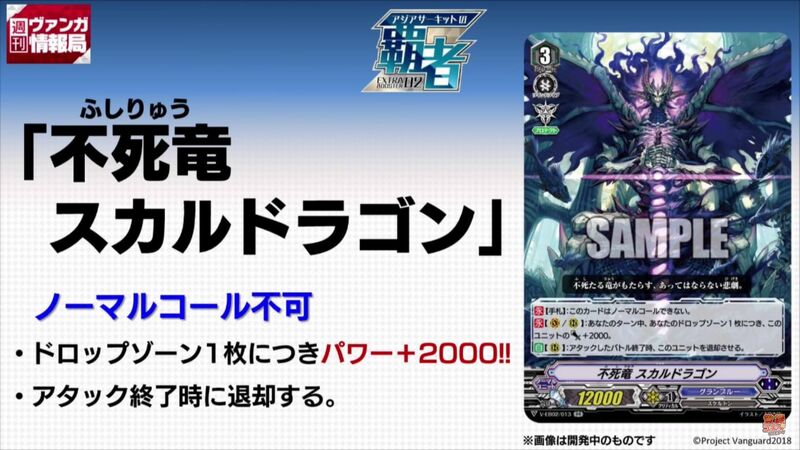 Royal Paladin has dipped slightly, but remains at a healthy 25%. 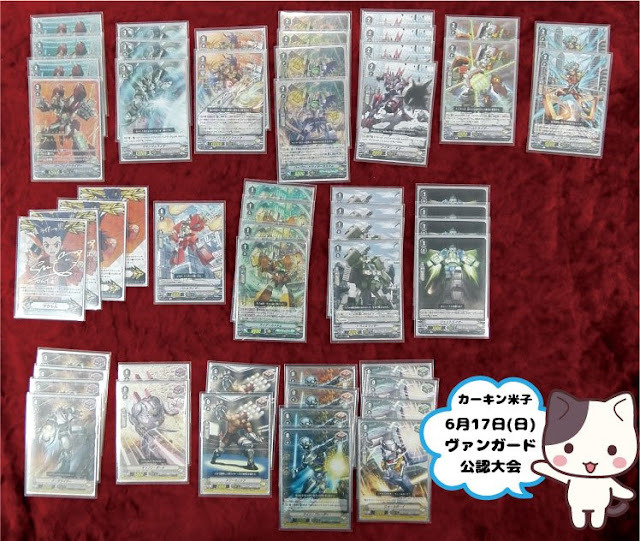 Nova Grappler's performance improved 5% while Kagerо̄ dropped significantly. 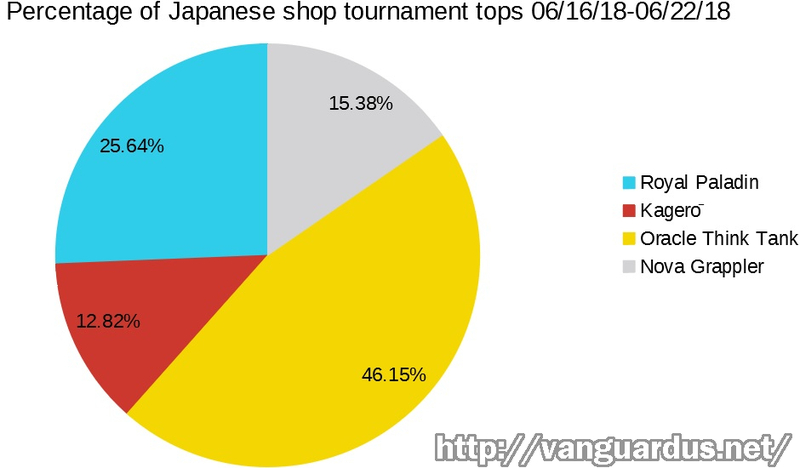 We have participation numbers for 15 of these tournaments, the high being 17 and the low 6. 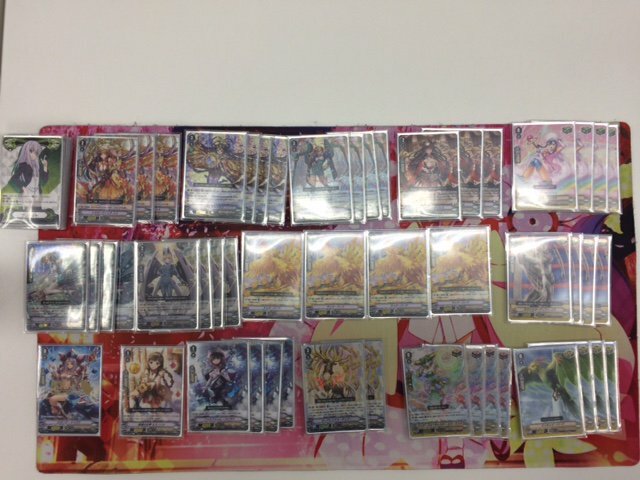 This is out of 39 reported results, 9 fewer than the preceding week. For the previous week's chart (06/09/18~06/15/18) see here.